Horneytown is located in the southeast corner of Forsyth County, to the east of Winston-Salem, and west of Greensboro, North Carolina. The tiny community of Horneytown, North Carolina received its decidedly suggestive name from early pioneers -- the Horney family -- who established a business and farm in the area before the Civil War. 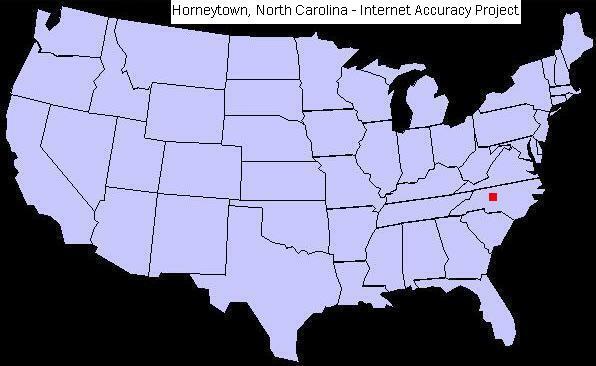 Time Zone: Horneytown, North Carolina is in the Eastern Time Zone. Boating, camping, fishing, hiking, swimming, bicycling, tennis and golf are just a few of the many outdoor recreational opportunities that abound in the area. You'll find a number of museums and furniture-related attractions in nearby High Point, the "Home Furnishings Capital of the World." "You have to go through Horneytown to get to High Point, and then on to Climax." NOTE: Horneytown, North Carolina is frequently misspelled "Horny Town" or occasionally, "Hornytown."